I am the first to admit that pinterest is a HUGE source of inspiration for me. In many ways this blog is a product of my pinterest obsession. I found so many other blogs through pinterest that I was inspired to make my own! Today's post is just one of MANY examples of some fabulous ideas I get from pinterest. 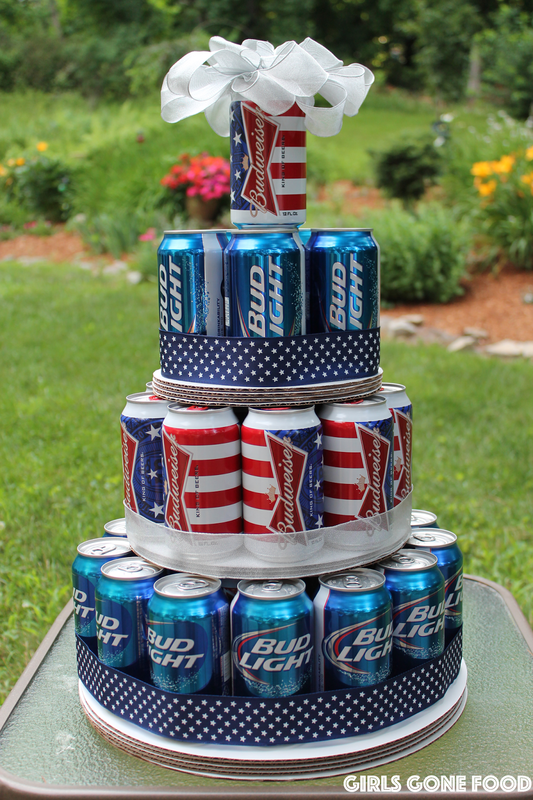 I know we have all seen beer cakes on pinterest. I decided to try it out for a friend's 21st birthday. Since it is still July, I took advantage of the patriotic Buds still in stores. I just loved their colors! To match the theme I found star ribbon at the craft store. I just love how it turned out! It is a really festive, unique, and practical gift...especially for a birthday or any type of celebration!! Read below to find out how I made this cake. You can follow me on pinterest here to see all the things that inspire me! Step 2: To make the middle layer, stack four 8" cake circles. Place about 10 beer cans on top. Repeat the rest of directions in step 1. Step 3: For the top layer, stack four 6" cake circles and place about 7 beer cans on top. Repeat the rest of directions in step 1. Stack 4: Stack each layer on top of one another. Stack 5: Place a final beer can and ribbon on top. Just clicking through! So funny to see this! My sister got one for her 35th birthday and gave one to my uncle for his retirement! I agree, FANTASTIC gift idea for any age (or if you don't know what to get him/her). Thanks for stopping by Scarlett!